Want to learn more about CA Release Automation? This complimentary webinar is designed to introduce you to one of the key features within CA Release Automation. It is based on the material delivered in the CA Release Automation 5.5.x: Application Design course. Through lecture and demonstration, you will learn the functions of components and see the differences between a standard component and a shared component. What’s in the session? Components represent groups of related deployment actions and typically represent the architectural components of the software being deployed. Components can be unique to the CA Release Automation application or shared by many applications. Shared components enable you to create a deployment logic once and share the logic across multiple applications. After this session, you will be able to explain why you would implement shared components, and also how to do it. 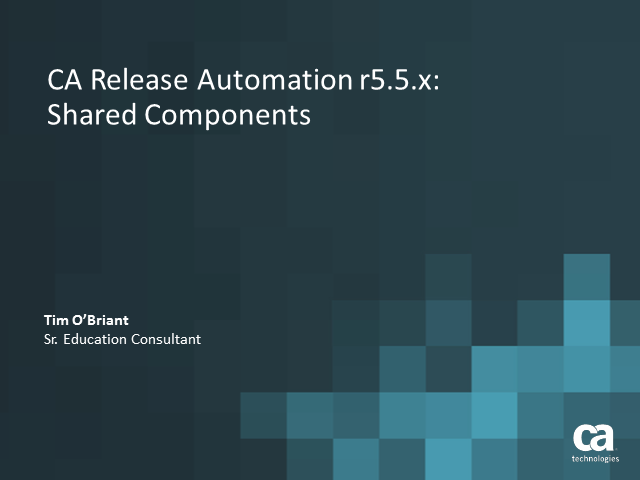 The webinar covers all aspects of shared component management, including how to create, share, update, and export and import shared components to other CA Release Automation installations. Want to learn about CA PPM’s new fully integrated reporting solution? Jaspersoft provides an innovative business intelligence solution with high performance report engine, state of the art dashboards, cool visualizations, self-service (ad-hoc) reports and rich analytics. Excers, an Authorized Training Partner is excited to offer this webinar in collaboration with CA to give you an overview of Jaspersoft and show you how easy is it to navigate and create your own reports using out of the box tools. The organization has implemented CA Product and Portfolio Management (CA PPM) in order to make effective and tactical decisions on what to do next… and what not to do next! But you only use a portion of the functionality that CA PPM provides. You would like to obtain a better understanding on how common business questions can be answered based on what features and/or functions are implemented. By knowing how the CA PPM modules fit together, this will assist you in identifying how the tables relate with each other and/or how functionalities impact each other. If you are a seasoned CA PPM user, this webinar will describe the modules you will learn in more detail for future training sessions whether you have or have not implemented them. If you are new to CA PPM, we will describe sample use cases of how customers may begin to use CA PPM. Join Kismet Silva-Smith, Instructor for CA Technologies and a Certified CA PPM Professional, for a presentation that will address the GOAL of understanding how the modules in CA PPM work together to address common business questions. And best of all, you will end up with the ability to run strategic and tactical ‘what-if’ questions against your portfolio of work! This webinar is a learning opportunity for CA PPM users of all levels. Users new to CA PPM will benefit from an informative overview of the product and its capabilities while advanced users will have the opportunity to discover some of the new features in CA PPM. Join Kismet Silva-Smith, Education Instructor for CA Technologies, for a free module of the CA PPM Project, Resource & Portfolio Management Bundle 200. This webinar is designed to introduce you to the new features and concepts of CA PPM. Kismet will review some basic functionality of Project and Portfolio Management using CA PPM, which allows users to create and manage investments through creating, staffing and analyzing. When you are trying to display data in custom OneClick subviews, you should verify that the data you are trying to display in a format that your Operators will understand. Sometimes that can be accomplished with simple calculations. Sometime it will be accomplished with the use of Renderers. In this presentation, I will show how to implement some simple calculations when displaying data in a subview. I will also demonstrate how to implement a Renderer to make that data most understandable for the people who need to consume it. Want to learn more about CA Spectrum? This complementary webinar is designed to introduce you to the features and concepts of CA Spectrum based on the material delivered in the CA Spectrum Foundations course. Through lecture and demonstration your instructor will review some basic functions of Network Management using Spectrum. Who should attend? Anyone who is using, or intends to use CA Spectrum and especially those who have little to no experience with this product. What’s in the session? This session will provide an overview of Spectrum’s fault isolation process. We will look into the out-of-the-box polling that is enabled by default and the out-of-the-box polling that is not enabled by default. Understanding how to manipulate Spectrum’s out-of-the-box polling can help you keep your network model accurate as well as allow for faster fault isolation. - If traps fail because of Configuration problems, polling can save the day. - The need for Live Link (also known as Live Pipes). Want to learn more about CA Spectrum? This complementary webinar is designed to introduce you to basic OneClick customization concepts of CA Spectrum based on the material delivered in the CA Spectrum r9.2 Optimization and Customization course. Through this lecture and demonstration your instructor will review some custom OneClick privileging. Who should attend? Anyone who is responsible for customizing the OneClick interface should attend this webinar. What’s in the session? This session will provide an overview of creating custom privileges for OneClick features. We will review default privileging and then learn how to create custom privileges and apply them to OneClick features. Want to learn more about CA Process Automation 4.3? This complementary webinar is designed to provide you, from an instructor’s perspective, with information on CA Process Automation (formerly known as CA IT PAM) and the new features in release 4.3 based on the material delivered in the CA Process Automation classes. Anyone considering using CA Process Automation and those already using an earlier version of this product should attend this webinar. Half of the presentation will be suited for beginners and the other half for those more experienced with earlier versions of CA Process Automation. Recent research shows there is a critical shortage of mainframe talent. Keep your staff ahead of the curve with CA’s Mainframe Academy. This webcast will discuss the current mainframe skills shortage and review CA’s award winning Mainframe Academy Program. You will learn how this vendor agnostic program will ease your mainframe succession planning pain through innovative content and methods and see why your teams need to participate. Want to learn more about CA Workload Automation AE? If you have installed WCC with a Derby database and now want to switch to an enterprise database to meet additional capacity requirements, standardize on database choice or other reason, this complementary presentation will provide the simple steps to change the database used by CA Workload Control Center (WCC). Your organization has rolled out CA PPM or CA LISA, or is in the processing of rolling out new functionality in either product but you are not seeing the adoption of the system that you had hoped for. You would like to understand ways that you can help ensure that your users not only use the system but use it the way you have intended. One of the keys to successful user adoption is to ensure you not only train your users before you go live but that you also make it very easy for them to get the help they need when they are in the live application. Having access to one-click help that describes your configuration with your business processes allows users easy access to help any time they need it. This help can be context sensitive (CA PPM) and role based so the user only sees the help they need. Learn how you can create this type of application help for your users and also use that same material to train new users in the form of web based training or over the web live training using the CA Productivity Accelerator. Join Melissa Fundanish, Director of Education Programs, as she shares the three keys to successful user adoption, the pillars of a successful change management plan and how you can integrate the CA Productivity Accelerator (CA PA) solution into your user adoption strategy to ensure you can train new users effectively and also support users in the live application easily. This will take the burden of training and supporting your users off your administrators’ or subject matter experts’ hands so they can focus on more important activities. Want to learn more about CA Service Virtualization? This complementary webinar is designed to introduce you to the features and concepts of CA Service Virtualization based on the material delivered in the CA LISA Virtualization Fundamentals course. Discover techniques for eliminating constraints and increasing productivity across the Software Development and Delivery Lifecycle. Through lecture and demonstration your instructor will review some basic functions of Service Virtualization using CA Service Virtualization, which allows developers and testers to create virtual services to simulate dependent components which are constraining them in delivering quality software on schedule. Anyone who is using, or intends to use CA Service Virtualization, and especially those who have little to no experience with this product. Some IT Web development and/or testing experience is assumed. This session will provide an overview of CA Service Virtualization. Participants learn how to create, deploy, configure, and utilize CA Service Virtualization to eliminate dependency on constraint systems. Students will learn the basics of virtualizing behavior of backend systems at the services layer. We use a simple Banking application to demonstrate the power of virtualization using CA Service Virtualization. •The concepts and benefits of Service Virtualization. While participants should find this webinar to be very insightful, they are encouraged to attend the related introductory course in full in order to effectively support their CA investments. NOTE: CA Service Virtualization was formerly known as CA LISA Virtualize. Want to learn more about CA Process Automation 4.2? This complementary webinar is designed to provide you, from an instructor’s perspective, with information on CA Process Automation (formerly known as CA IT PAM) and the new features in release 4.2 based on the material delivered in the CA Process Automation classes.